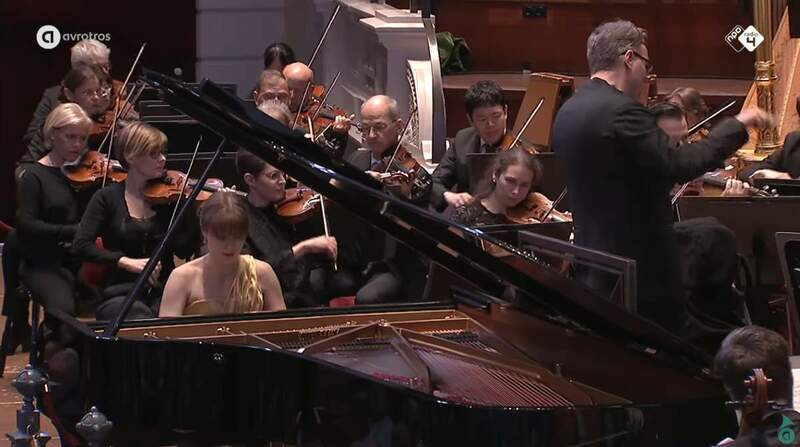 Accompanied by the Nordwestdeutsche Philharmonie (North West German Philharmonic), Ukrainian concert pianist Anna Fedorova performs Pyotr Ilyich Tchaikovsky’s Piano Concerto No. 1, Op. 23. Conductor: Yves Abel. A High-Definition recording of a live concert in The Royal Concertgebouw Amsterdam, which is part of the NPO Radio 4-series The Sunday Morning Concert. Published by the AVROTROS Klassiek channel. Pianist Anna Fedorova is well known for her performance of Rachmaninoff’s Piano Concerto No. 2. Her interpretation of this work on our YouTube Channel has over 19 million views! Tchaikovsky’s first piano concerto is also one of Anna Fedorova’s all-time favorites and it’s full of tenderness and bravura. Enjoy! ianist Anna Fedorova and the Nordwestdeutsche Philharmonie led by Yves Abel perform Tchaikovsky’s ‘Piano Concerto No. 1’ in The Royal Concertgebouw Amsterdam. The concert is part of the NPO Radio 4-series The Sunday Morning Concert. The concerto is composed between November 1874 and February 1875. It was revised in the summer of 1879 and again in December 1888. The first version received heavy criticism from Nikolai Rubinstein, Tchaikovsky’s desired pianist, who considered the concerto was unplayable. Rubinstein later repudiated his previous accusations and became a fervent champion of the work. It is one of the most popular of Tchaikovsky’s compositions and among the best known of all piano concertos. The work is scored for two flutes, two oboes, two clarinets in B-flat, two bassoons, four horns in F, two trumpets in F, three trombones (two tenor, one bass), timpani, solo piano, and strings. Allegro non-troppo e molto maestoso-Allegro con Spirito (B♭ minor – B♭ major): The first movement opens with a bold horn call heralding a series of powerful chords from the soloist. The strings introduce an expansive theme, which is then taken up by the piano. Andantino Semplice – Prestissimo – Tempo I (D♭ major): The second movement, by contrast, is languid, with lighter use of the orchestral instruments. Allegro con Fuoco – Molto meno mosso – Allegro vivo (B♭ minor – B♭ major): For the finale, Tchaikovsky offers a rondo with various alternating melodies, some of which are heard more than once, and ends by returning to the power-driven energy of the opening. Anna Fedorova was born in Kyiv, Ukraine, into a family of musicians, and she began playing the piano at age five. She gave her first public recital when she was six, and her national debut was in 1997, at the National Philharmonic Society of Ukraine. She has claimed top prizes at numerous international piano competitions, including the International Rubinstein ‘In Memoriam’ piano competition, the Moscow International Frederick Chopin Competition for young pianists, the Lyon Piano Competition, and recently became a recipient of the Verbier Festival Academy Award. She is also a two-time laureate of the Dorothy MacKenzie Artist Recognition Scholarship Award at the International Keyboards Institute & Festival (New York, USA). A graduate of the Lysenko School of Music in Kyiv (studio of Borys Fedorov), she studied at the prestigious Accademia Pianistica in Imola, Italy under professor Leonid Margarius. She has also received artistic guidance from world-renowned pianists like Alfred Brendel, Menahem Pressler, and Andras Schiff.